The hardware is impressive, but much of the real damage is done by the prosecutors. The prosecutor at Matthew Townsend’s March 19 preliminary hearing appeared to be auditioning for a Daytime Emmy. Her subsequent performance, and that of her colleagues, may be sufficient to earn a criminal contempt charge. Townsend, who is active in the Cop Watch (or police accountability) movement, was arrested without cause on February 2nd in Meridian, Idaho for the supposed offense of walking away from a cop who wouldn’t charge him with an actual crime. On the eve of his hearing he protested that mistreatment in a Facebook post promising a “shame campaign” against his kidnapper, Officer Richard Brockbank of the Meridian Police Department – and any public officials who collaborated in that outrage. The Meridian PD wanted to prosecute Townsend for felonious “intimidation of a state witness,” a charge without merit that summarily convicts Officer Brockbank of cowardice. The intent was to have Townsend arrested before or during the March 19th hearing on his “resist and obstruct” charge. 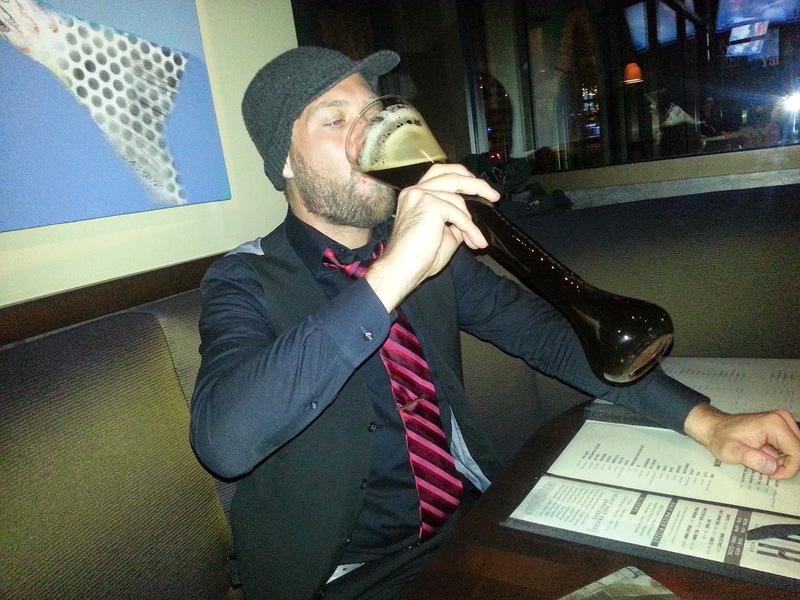 Happier times: Matt responsibly enjoys an adult beverage. Nothing therein could be construed as a threat of any kind, let alone what is called a “true threat” as defined in current case law – under which the statement in question would have to be evidence of imminent, unlawful violence. Seeking to disseminate his message, Townsend tagged dozens of people – including every significant media outlet in Idaho, and several others nation-wide. He also tagged everyone he could find who shared Officer Brockbank’s surname. Germaine (from her Facebook page). Ms. Germaine’s rejoinder was worthy of a junior varsity High School debate competition. Germaine graduated from law school two years ago. This isn’t long enough to have forgotten the relevant case law, which doesn’t sustain her claim that a conditional promise to carry out “non-violent” legal action can be treated as a “threat.” This means she either never learned that case law, or simply chose to ignore it. Perhaps Germaine was hoping that youth, charm, and apparent earnestness would overcome the deficiencies of her argument. They didn’t. Judge Cawthon ruled in favor of the defense’s objection that prior notice of bond revision was necessary. Respecting his rights: Judge Cawthon. The evidence – such as it was – had been presented to the trial judge, who made a finding of fact that it was insufficient to justify revocation of bond. The prosecution was not deprived of a remedy: It could present any additional evidence against Townsend at the hearing scheduled for March 30, unless it decided to drop the charges. Pending the second hearing, Officer Richard Brockbank – the poor, timid little thing – would have to butch it up, relying on his body armor, weaponry, and the intangible yet impregnable shield of “qualified immunity” to protect his vulnerable ego and sense of privilege against the withering assault of Townsend’s rhetoric. This would have solved the problem, if one had actually existed. 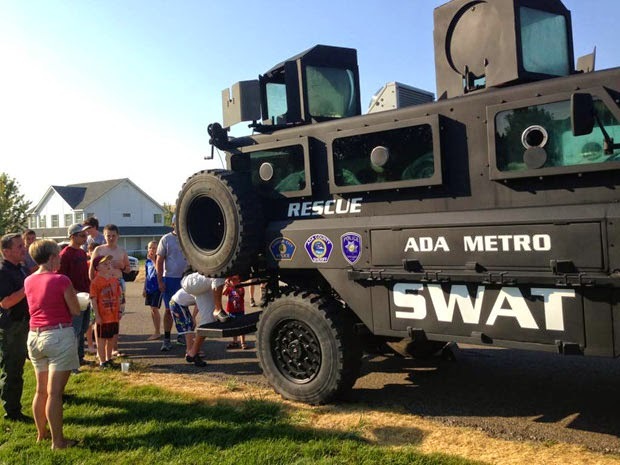 Instead, the Meridian Police Department and Attorney’s Office went judge-shopping. A complaint was filed by Ada County DA’s office citing a carefully cropped – and artfully dishonest – rendering of Townsend’s Facebook post. It was, in substance, indistinguishable from the version of the post in which Judge Cawthon had found no evidence of a genuine threat. By way of an ex parte hearing, and in violation of the existing order by the trial judge, an arrest warrant was obtained against Townsend. In addition to being patently unethical and undeniably vindictive, this was quite probably illegal. Can they defend poor Officer Brockbank from harsh Facebook posts? The trial court judge before whom the facts had been presented had ruled that the supposed victim – the intrepid Juggernaut of Justice known to lesser beings as Officer Richard Brockbank – had suffered, or stood to suffer, no “injury” of any kind as a result of Townsend’s Facebook post. The prosecution obviously did not make this known to its hand-picked judge, nor did they give notice to the defendant of the impending second complaint. 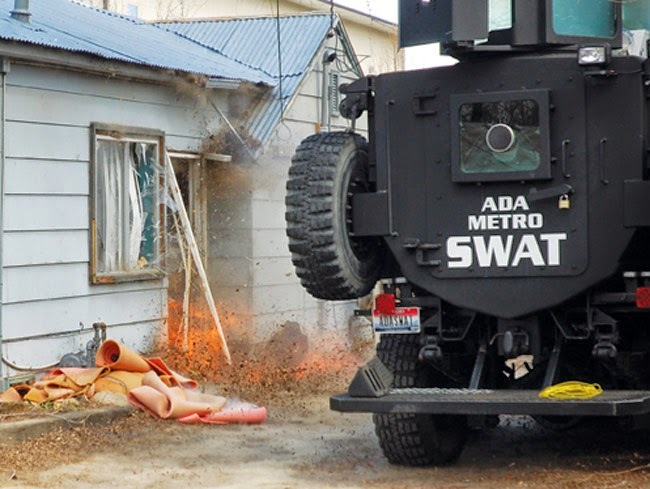 Although assistant Ada County DA Kari Higbee’s name was on the complaint, Abby Germaine was the official who “routed” the case to the County DA’s office. She was the one who developed the evidence – such as it was – and was present when Judge Cawthon issued his ruling. Interestingly, the officials behind this prosecution are not willing to disclose the names of those who played the most important roles therein. Ms. Germaine did not directly respond to multiple direct inquiries asking that she either confirm or deny that she acted as prosecutor during the March 19 hearing. A spokesperson for the Meridian City Attorney’s Office confirmed that they “contract all of our prosecutions to the Boise City Attorney’s Office" -- where Germaine is employed in the Enterprise/Land Use division. While nobody would confirm that Ms. Germaine acted as prosecutor in the Townsend case, her name was called by Judge Cawthon at the beginning of the hearing, as recorded in the courtroom audio. She has just recently begun her legal career. She is more vulnerable than her colleagues, and in the event the matter gives rise to a civil rights lawsuit – as it should – her name will be one of the first listed in the complaint. She may be also left to endure, by herself, the career-killing impact of a contempt of court charge, and appropriate sanctions by the Bar. If Judge Cawthon’s findings “were hidden from the second judge, there should be hell to pay,” opines Jerri Lynn Ward, a veteran defense attorney from Texas. The second judge “is now a witness” if Townsend’s attorney files a motion for contempt. In this case, Ward believes, if the prosecutor responsible for Matthew Townsend’s arrest warrant “misrepresented facts to a second judge, her career should be over” – which could apply to either Germaine, or Higbee, or both of them. Defense attorney Susan Gerber, who served as a deputy state Attorney General in Oregon, offered substantially the same assessment of the case, albeit in somewhat empurpled language. J. Andrew Lauer, a former prosecutor in both Colorado and Washington, presents a more ambivalent view. The prosecution did what was necessary to prevent the second judge from being apprised of Judge Cawthon’s ruling, and to avoid a “contested hearing” that had been scheduled for March 30th. Lauer believes that the prosecution has "the option of charging the defendant sooner, in a new case ... regardless of how [Judge Cawthon] would probably have ruled or will rule" in the scheduled hearing. Waiting for an adversarial proceeding of that kind wouldn’t be satisfactory to the Meridian Police Department and Attorney’s Office. As Judge Cawthon pointed out, the hearing was necessary to protect Matthew Townsend’s due process rights, and require his accusers to provide evidence of an actual crime. 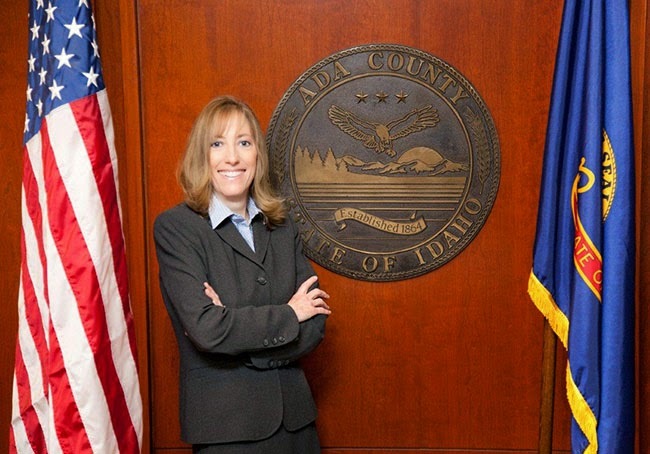 Clean up this mess: Ada County DA Jan Bennetts. In this fashion, to paraphrase a similarly abusive prosecutor in another part of the Gem State, “punishment would be achieved” -- even if the meritless charges were eventually dismissed. It should not be forgotten that Townsend’s original infraction was to walk away from a police officer who had refused to charge him with a crime. When Officer Brockbank subjected him to an unlawful arrest, Townsend did not resist in any way. Gadfly: Matt Townsend's 2014 campaign sign. Although those who commit “contempt of cop” are subject to severe summary punishment, that offense is not found in Idaho Code section 18-1801, which lists “Criminal contempts.” Specific mention is made, however, of “contempt of court” through “Willful disobedience of any process or order lawfully issued by any court” (emphasis added). That applies to ruling issued by Magistrate Judge Cawthon. The real crime here, let it not be forgotten, is not an offense to the supposed majesty of any court, but the repeated violent abduction of an innocent and harmless man as punishment for the peaceful exercise of his rights. In this entire affair, Matthew Townsend has never broken the law, and his official persecutors have never obeyed it. No law forbids a citizen to walk away from a police officer who refuses to charge him with a crime. Nor is it a criminal offense to publish a Facebook post demanding that a spurious charge arising from that incident be dropped, and promising non-violent, peaceful protest if that demand isn't granted. No law authorized Richard Brockbank to arrest Matthew for the first act, or Abbey Germaine to pursue a felony charge for the second -- particularly in light of Judge Cawthon's finding that the second charge had no merit. We are supposed to believe that those actions reside within the discretion of public officials. Someone who is ruled by the "discretion" of another is, to that extent, a slave. I am profoundly grateful for the generous help provided by so many of you to keep Pro Libertate online. Thanks to you, we'll be able to pay our bills this month -- even though we are still looking for a new home. Thank you so much, and God bless. Thanks for the post. I appreciate you keeping us updated on Mr Townsend. I posted something on Meridian police department page that I'm sure will tick them off but so be. If they didn't have anything to cover up makes no sense they posted as they did to make it appear they were serving justice on their made up charges. This type of willful criminal misconduct occurs for one fundamental reason....BECAUSE THEY CAN. The system rarely holds them accountable and on the rare occasions it does the punishment is minimal at best. we are incessantly told, as each invasion of our privacy comes to the fore, that if we're honest, we have nothing to fear. from the same perspective, just what do all those 'law enforcement' types have to fear? their actions show they have something to hide. if not, they would not pursue the man who watches them as they have. in fact, if they were honest, the man watching them could be their witness. we know the reality despite what they say by seeing what they do. they have much to hide. that is why this story is as it is. More than well said, Kirk. They have much to hide. Many of us refuse to sit down and pat ourselves/each other on the back and say, "It's ok honey. There is nothing to fear"
Can anyone with a shred of intellectual honesty still maintain that the USA is a "free country"? This costumed thug felt "dissed" by an individual who either failed or refused to grovel before his "authority". So he dared to walk away from a "Law Enforcement Officer", merely because he committed no crime? The nerve of him! More than enough to motivate the thug to show the mere mundane "who's boss". Master and servant have become reversed in the USA. Anyone who still refuses to acknowledge this reality is a slave who is beyond hope. I agree with you Bevin and Dan. Justice no longer exists. I have not believed the U.S. is a "free country" for a long time. If one wants justice it means fighting for it with a tenacity never needed in times past. On March 6, 2012, the police broke into my property under false pretenses on an unfounded zoning allegation. They claimed they received a call for a wellcare check, when in fact, the CD recording of the phone conversation to the police department shows it was a call about “a large amount of dogs” (town dog limit law). I wasn't mentioned. Had the complaint been processed through the correct protocol, the Zoning Department would have generated a letter, would have discovered I’m grandfathered 28 years as a legal business, and that would have been the end of it. Instead, they proceeded with theft of property under the color of law and other actions against me. They executed multiple illegal searches with other officers and civilians prior to obtaining a highly defective search warrant. They unlawfully seized two five year-old dogs that were healthy, active, happy, in no pain, not suffering from anything --- but were born deformed. Four days later, without my knowledge, permission or court order, the dogs were surgically mutilated and other services performed on them. I wasn't even charged with anything at that time. For the next six weeks, they continued to trespass, doing warrantless searches, accompanied by civilians and others. They came six weeks later with not only another highly defective search warrant that had no Application for that warrant (wasn’t signed and sworn-to until the following day) and with no probable cause, the judge unlawfully authorized two veterinarians and others to come here to LOOK FOR VIOLATIONS! Although I wasn’t charged with anything for the balance of the dogs, and without statutory authority, the judge authorized civilians and police to come onto my property daily to maintain my dogs until all dogs are removed by June 1, 2012. Because I took photos and notes while they were here, an unlawful Order of Protection was issued to force me to stay a great distance away from them to make my memorializing what they were doing impossible. A fabricated deposition was signed the following day and without a lawyer, arraignment or hearing (contrary to what is mandated by law), I was sent to jail where I sustained multiple injuries, including a traumatic brain injury and severe claustrophobia. Another judge threw out the Order of Protection in its entirety in August 2013 as being illegal. During this entire time that all these egregious things were being done to me, the judge refused to appoint a lawyer. I stood alone in front of the judge and ADA at all appearances. I finally spoke up at a hearing and told him that I had a right to an attorney. He replied, “And I have a right to move this case forward.” And he did. Shortly after that, he and his brother, the judge that unlawfully sent me to jail, recused themselves. Because they took my source of income, I have been unable to pay my taxes and the County took title to my house and 92 acres March 2, 2015. I will be homeless. Previously, the then-NYS Attorney General sued the town and had Federal monitors on top of the police department because he considered them "dangerous". I have 1,500 photographs, four boxes of files, over 300 WORD documents, about 1,000 emails with notes, a CD recoding of the original complaint call made to the police department, and a video taken by a TV News crew from a helicopter that shows the conditions that really existed here at that time. My complaint to the Inspector General of the U.S. Department of Justice backfired. They forwarded my compliant to the very police department that is the basis of my complaint and told me to contact them if I had any questions. I am scared to death of retaliation. Sylvia -- could you contact me at WNGrigg [at] MSN [dot] com? Oh my gosh, Sylvia. This is horrific and heartbreaking especially if you love dogs. What they did to the dogs is beyond insanity. They have clearly over and over went beyond their bonds and why??? I hope you can help Will. I understand your fear of retaliation. I'm so sick and tired of the government, police, etc destroying lives and property at their whim.